Peep Jousting. Purple is the winner! 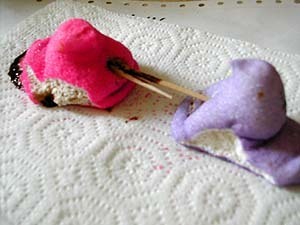 Poor pink started to seriously melt and turn into some weird, tar-like substance.. Wallpaper and background images in the marshmallow Peeps club tagged: marshmallow peeps image funny medieval joust torture.